+ Finish reading the books on my Uni reading list. I've been trying to squeeze in as many other books as I could, but I'd like to have read every set book once before the craziness begins again. + Go to my cervical screening appointment. Update: after putting it off since I received the letter at the end of last year I brought my appointment, which was supposed to be this week, forward to the end of last month. It took a couple of minutes and honestly, I thought it was even less scary than going to the dentist! + Organise, organise, organise - lots of little notebooks help with this enormously! + I'm falling into a routine of posting on alternate days on both of my blogs and I'd really like to keep that going. I think dedicating time to something I love is as important as investing time in the things I have to do. + Keep making time to light a couple of candles and relax. It's okay to take half an hour and not do anything at all. Is there anything on your to-do list for this September? I definitely want to read and relax more! I think those appointments can be really scary to women who haven't done it before, it's so quick and painless but I absolutely hate the dentist - it's wayyy worse! I've found myself struggling to make time for the things I love as uni gets a bit more busy and this post reminded me to put some time aside for reading and relaxing. Yeah I should be totally more organizing as well.. I'm sure you'll manage brilliantly in your to-do list! Posting more consistently is definitely also on my to-do list for september! Agreeing with the last two especially! Nothing wrong with taking time out for ourselves. Cute list! Candles are no 1 on my list for ways to relax! 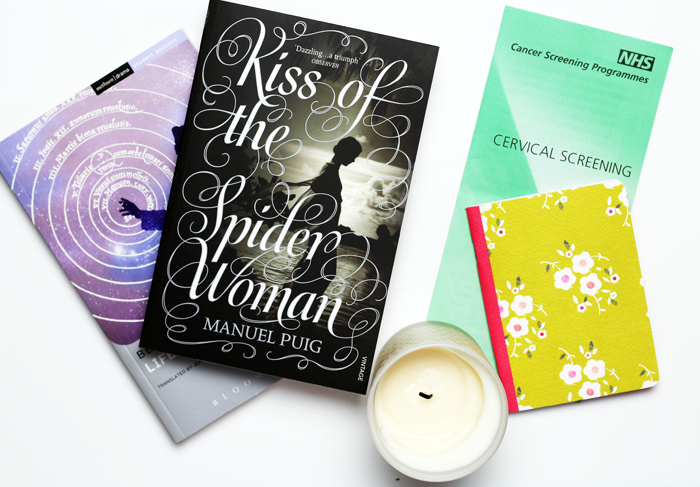 I really need to go for a cervical screening appointment. thansk for the reminder! Ugh, I definitely do not miss having 'required reading'; it's so nice only having to read for leisure, again! Lovely to-do list, Jennie - especially now you've got the cervical screening out of the way ;) I love the idea of lighting some candles and spending a half hour doing absolutely nothing. Bliss (though actually quite hard to do!) Is that Kiss of the Spiderwoman in the picture above the same story as the musical of the same name? I hope you're well Jennie, I haven't popped over here in a while as I have been so busy. Hoping for a catch up this afternoon. Your photo is lovely! I just bought a new notebook today, I have a definite notebook problem.. They're so handy though!! I think I sometimes forget to dedicate time to what I love and that it's okay to take half an hour off. When trying to plan my time I'm going to remember those from now on! My goals are read at least two more books this month, watch a few old films I've had on my list for a long while, and to try and maintain some sort of consistency with writing a blog, but doing it in a way I enjoy rather than feel I have to. Thank you for always taking the time to comment on mine. I love that you included your health screening on this too- it's such a taboo subject and I think it's great that you've got people thinking about their own! I want to read more this month, keep up to date with any uni work I get and try it get creative with some blog posts!